It is not something I am very good at and which is probably why I have refrained from running in the past. However this changed last week when at work there was a 10km charity team relay. Basically team of five members who ran two laps of the school field on a course which had been measured out at 1km. As the winter approaches and the evenings become darker it isn’t as easy to get out on the bike in the week. The dark evenings also provide a suitable amount of cover for when I pull myself around the streets close to my house. If I manage to continue to keep this going it will really help with the winter training which until now has fully stopped due to the pressures of work etc. I have managed 2 runs since the weekend the first being quite frankly horrible. My breathing was out and I had to walk more than I felt I should and I managed 3.5km in a very sorry 26 minutes. At least the second run last evening was better as I managed 4km in 25 minutes so at least there has been some progress. I know these figures are hardly earth shattering (that is just the effect when my heavy body smashes into the ground), but I suppose it is a start and we all have to start somewhere. What do I hope to achieve? I hope the end result will be less weight which will help when on the bike (and running) and improved cardiovascular ability which means I can go further for longer. This combined with the full on training programme come the spring should have me fully prepared for 2014 and the rides which I aim to complete, Ride London 100 (if I get through the ballot), either London to Brighton or Dunwich Dynamo and the possibility of the school cycle event which I will need to organise. So there could well have been a shift in activity, along with a change in the season, but the end goal is still less weight and go longer on the bike. All through hard work and more hard work. No turning to the dark days of cycling to help me through the long dark winter which faces us. This entry was posted in Cycling, Sports (other), Training and tagged Brighton, change, Cycling, cycling slo, Dunwich Dynamo, England, getting better, improved performance, its a start, London, London to Brighton, motivation, running, Sports, Train, training, weight loss, winter training. 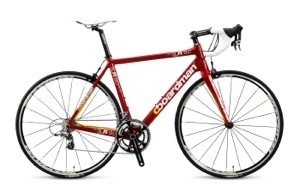 My plan for 2014 could be coming together after a brief chat with a friend when I saw him with his shiny new bike, a Boardman in red with the same pedals I have on my Specialized Allez Sport. He is a fellow teacher at another secondary school in the area we both live. We are also both governors at our local primary school so see each other a lot, however this is not the main point of the blog. A team of staff (12 in total) will be cycling from their school to Brighton, I assume for charity, but even if not it is a good twist upon the London to Brighton rides I have completed over the last two years. The will set off from their school, Birchwood, and cycle the 94 odd miles straight through London to the south coast city. Sorry that should read 151.2km as to not fall fowl of the rules. In effect is is a fairly strait line on the map, so a good route, and this has got me thinking. Each year at my school we have a charity week with loads of different fund raising events from cakes sales to more energetic events like our version of Strictly Come Dancing, or as it was called Strictly Come Prancing. In effect the fundraising goes on for much of the year and is organised mainly by the students and they do a fantastic job. Anyway back to my thinking and yes this involves bikes again. From earlier posts I have been looking for something a little different for 2014. I am now thinking there is an opportunity for a staff team to cycle from our school (which starts with an L) to another UK town or city with the same letter. The first place which came to mind was Leicester. A nice 177 km but going inland means we wouldn’t finish near the sea. Another option was Lowestoft on the coast of East Anglia. This would be 167km and could be completed in a day without too much trouble even is a large group all travelling together. The advantage here is you could cool off in the sea afterwards and I think the beach might be a sandy one rather than the pebbles of Brighton. Other locations which would have to be discounted this time round purely on location would be Looe and Liskard in Cornwall, both lovely places and anything past Leicester so Liverpool would not be possible on a first attempt. Wherever the location is needs to be more than 161km just to break the 100 mile barrier! The location can be sorted in the next few weeks but the main consideration would have to be the time for the event. Obviously it couldn’t be on a school day as there is work to be done, but could easily be a weekend and probably best if it was one which was attached to a school holiday, but this isn’t essential as I went to work after the London to Brighton rides. Quicker recovery comes to fitter riders, so More preparation would be required. Then there is getting a team together to complete this with me. There are a few cyclists amongst the staff who could be interested in completing this challenge if we get it off the ground. I think between 8-14 riders would be a good number to allow us to ride at a reasonable speed whilst doing so as efficiently as possible in a long train. I can see an email in the next few weeks being set to the team who organise the charity events. I can organise the ride it’s the charity aspect I would leave to the group. Then there would be the kit. I feel for such an event there should be matching kit so people know who we are and what we are doing. Ideally a cycling clothing manufacturer would hear about this idea and be willing to kit us out in order for the team to perform well on this super fundraising event. Note to self, go and chat with the local bike shop down the road from school to see if they want to get involved. The worst they can say is No Thank you! When this gets a bit more than just an idea I will approach more outside organisations and see who would be willing to help. Well the next job is to send an email to the staff who co-ordinate the charity work which goes on in school, and if that gets the green light then start to gather a crack team of cycling staff from work who will complete a great challenge for as yet an unknown charity, whilst getting in fantastic shape doing it. As always when I have more I will keep you all informed! This entry was posted in Cycling. A clash in 2014! What should I do? The weekend of 12-13th July will be a busy one for cycling. On this night two night rides are due to leave London, one heading south whilst the other in a north easterly direction. The question is which one to do? The first of these rides is the 60 mile London to Brighton night ride for The BHF. This is a ride I have completed for the past two years and has become something of an annual event. It is a well organised event and I still have unfinished business with this ride, to complete it in less then 4 hours! The other ride is the Dunwich Dynamo, a 120 mile ride from North London to the lost city of Dunwich on the Suffolk Coast. This is a turn up and ride event and as a result has less support if things go wrong. However it has a certain appeal and would be the longest ride I would have completed in one go. Plus it is a ride which has been on my radar for a few years now. The question is which ride to compete. Last year I should have done both as they were a weekend apart. This would have been a huge effort but possible. In 2014 this isn’t an option. Hindsight is a wonderful thing! So how should a decision be made? Take on the new, longer challenge and complete a PB on a bike, or really go for the sub 4 hours for London to Brighton, another PB. I suppose this comes down to the bigger plan for 2014. In February I will find out if I am successful in the ballot for the Ride London on 10th August. If I am then the longer more challenging 120 mile ride makes more sense. Complete this and just a month later complete 100 mile ride which includes parts of the Olympic road race course. Or take it easier and save myself by completing a 60 mile ride a month before Ride London. Both rides end up at the coast and both on a shingle beach so it will come down to the ride. I think some serious thinking will have to be done as well as working out the correct training plan. Also a chat with a few friends who could be interested in both of the challenges. Oh well decisions. If you have any advice, I’d love to hear from you. It could be your piece of advise which helps me decide.